Google. It’s so synonymous with online searching it’s become a verb. Google’s rise to tech giant status began in 1995 when Stanford student Sergey Brin was assigned to show University of Michigan graduate Larry Page around the Stanford campus. Although they might not immediately have hit it off (both have since said they thought each other “pretty obnoxious”), as Brin says, “Obviously we spent a lot of time talking to each other, so there was something there”. The two reconnected in 1996 when Page reached out to Brin for help with his doctoral thesis on the World Wide Web. Page wanted to focus on the link structure of the Web, exploring the possibility of using links between Web pages to rank their relative importance, and developing an algorithm to count and qualify every back link on the Web. This is where Brin came in. “I talked to lots of research groups and this was the most exciting project, both because it tackled the Web, which represents human knowledge, and because I liked Larry,” Brin told Wired. The resulting algorithm – PageRank – was the first algorithm used by Google to order search engine results and is still its best known. In March 1996, Page’s web crawler, starting from his homepage at Stanford, began exploring the estimated 10 million documents that comprised the Web at the time. Page and Brin soon realised that their tool had potential as a search application: “We realised that we had a querying tool. It gave you a good overall ranking of pages and ordering of follow-up pages,” Page recalls. The two students created a search engine that searched only the words in page titles then applied PageRank so that results were sorted by relevance. They found the results were far superior to the other search engines available at the time, which ranked mostly using keywords. 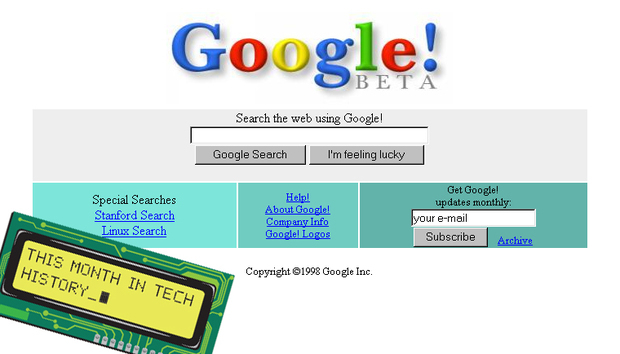 The first version of Google was released on the Stanford Web site in August 1996. According to Google’s own history page, BackRub operated “on Stanford servers for more than a year—eventually taking up too much bandwidth”. Google.com was registered as a domain on 15 September 1997. The name— is apparently a play on the word “googol” and “reflects Larry and Sergey's mission to organise a seemingly infinite amount of information on the web”. Google’s current headquarters in Mountain View, California, is, as its careers site notes, “a long way from its humble roots in a Menlo Park garage”. The company outgrew its garage in February 1999, moving to 165 University Avenue in Palo Alto with just eight employees, before moving again just six months later to its first Mountain View location: 2400 Bayshore. Five years later, in March 2004, the company, now with 800+ employees, moves to 1600 Amphitheatre Parkway in Mountain View – now known as ‘Googleplex’. Google’s popularity has led to questions of a new religion – ‘Googlism’ – with The New York Times discussing the topic “Is Google God?”. There is even a Reddit community Church of Google, not to mention a Facebook page, or for those unsure, a Rational Wiki page dedicated to the ‘religion’. Google tends to celebrate its birthday each year on 27 September with a celebratory Google doodle, a full archive of which can be found here – well worth a visit should you ever need a distraction.